Here’s a brainteaser: How does a massive cruise ship end up on top of a cliff? Natural causes—a tsunami, maybe? In 2011, the 9.0 magnitude Tōhoku earthquake and tsunami did pick up and drop ships across different inland locations. Perhaps it was placed there strategically by engineers and scientists? In 2014, the beached Costa Concordia was floated and towed away from its crash site. The truth is that neither natural causes nor magic tricks put this vessel where it’s rested for over 14 years. Read on to learn more about the story behind this South Korean ship-on-a-cliff. This picture is not a Photoshop job. 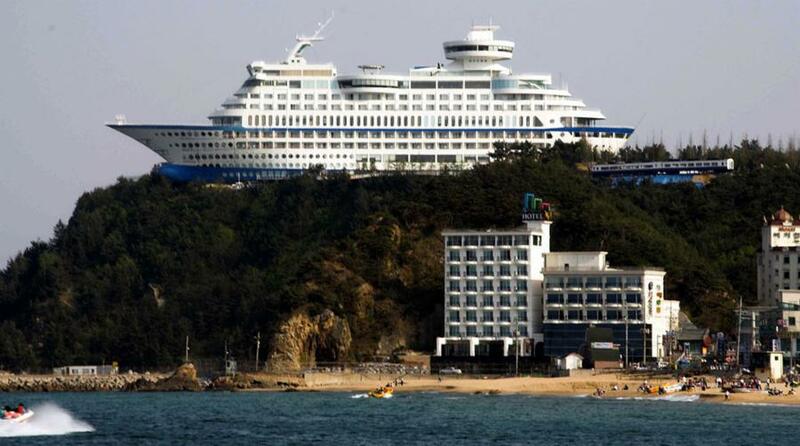 The big boat, called “The Sun Cruise,” is safely perched on top of a dry, rocky cliff in the city of Jeongdongjin on South Korea’s east coast. And the boat is real, too. You’re more than welcome to step inside and even stay the night. This ship opened for business in 2002 as the first of its kind in the world. 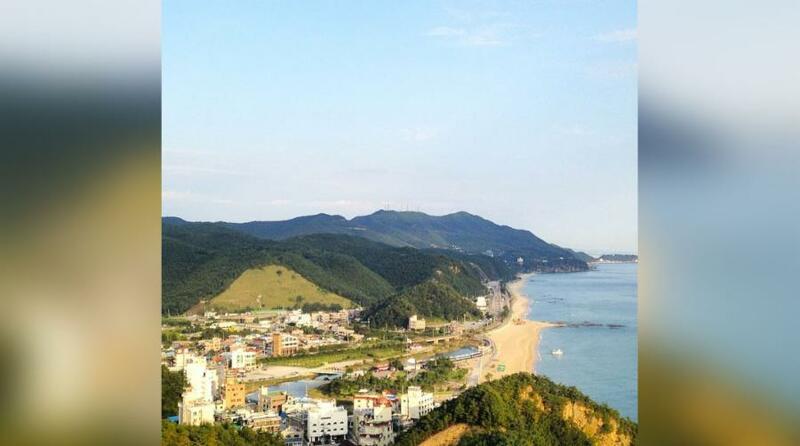 Located in the South Korean town of Jeongdongjin, the structure overlooks a beach resort and the Sea of Japan. At 541 feet long and 148 tall, the vessel has 211 guest rooms and six restaurants. 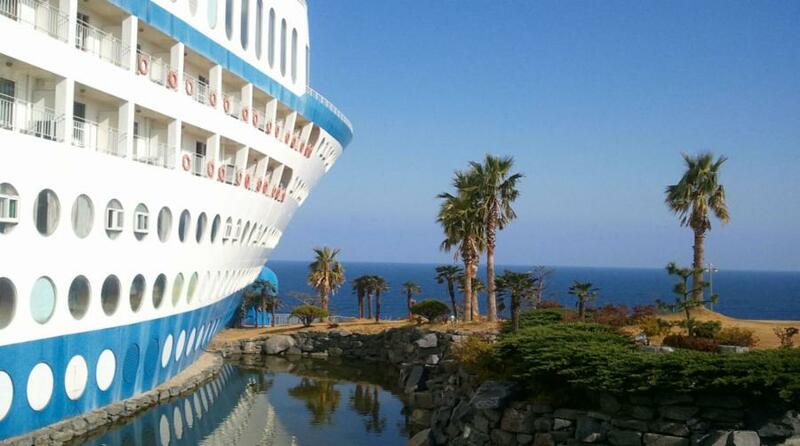 In case you haven’t guessed it yet, the cruise ship on a cliff is a resort and hotel! 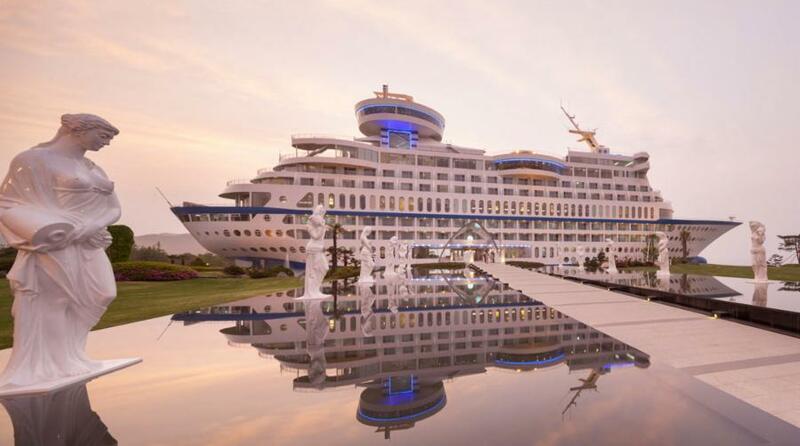 It’s called The Sun Cruise Resort Yacht, and it was built on land with almost all of the amenities found on a cruise at sea. 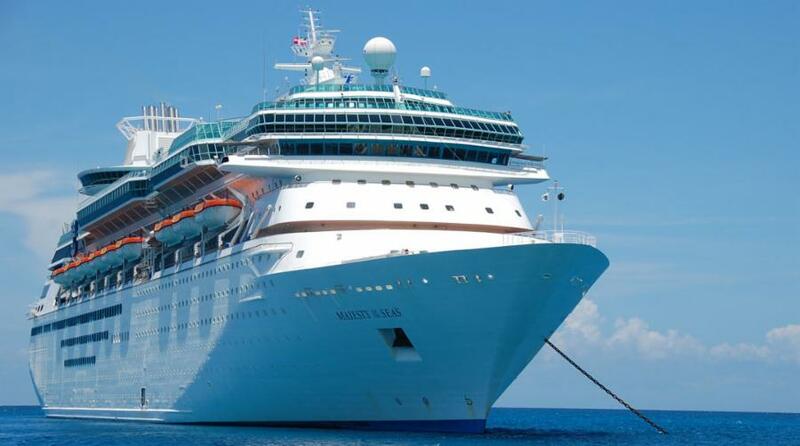 Pictured here is the hotel’s inspiration: A Royal Caribbean International Sovereign Class cruise ship. There are landscaped gardens adjacent to the Sun Cruise, pictured here. The park features a variety of sculptures, as well as an observation area with a glass floor suspended above the sea. Fishermen sail into the Sea of Japan to catch Pacific saury, abalone, and sole. The town is a picturesque destination and a favorite spot among locals. There are 211 rooms in this hotel, including bedrooms and apartments. Six function rooms allow for banquets and gatherings of all types, and six restaurants serve Korean and European food. The rotating top-floor bar gives visitors a panoramic view of the horizon. There’s also a golf range, volleyball court, and fitness club.